Yesterday was my friends daughters 8th birthday party, She had a pottery party and I was asked to go along to help. 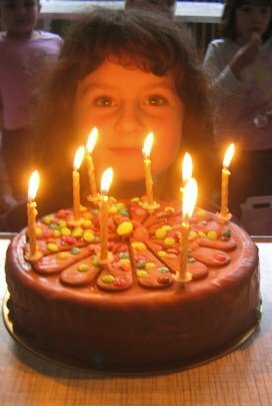 We had a brilliant time, it was a really fun party and I might just have one the same for my next birthday!! 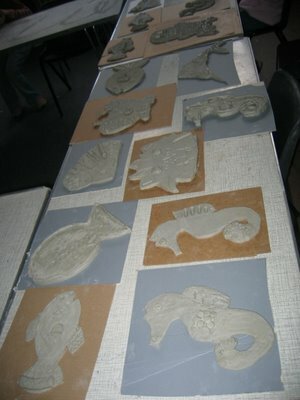 The children made pottery animal tiles. When they are dry the children will be able to paint them too. I wish they had had parties like this when I was growing up. Last night after the party we went to see The Mighty Boosh in Cardiff. This was my christmas present to my husband Andrew. It was really good. My Mum and Dad came over to look after the children, and I must keep this short, as my Mum is still here and I should be with her and not with the computer!! We had a good time, and it was nice to go out as a couple without the children. 90% of the audience appeared to be students though, with did make me feel a bit old, and there were some nutters wandering around the town afterwards, though I suppose that is to be expected when there is a match on. Well, I am going to go and catch the last few minutes of ' The World' with Andrew and my Mum. Oh also spring may be on its way after all, today we have had brilliant sunshine all day, although it is still cold, it's a start!